Crows have a reputation as troublesome neighbors, sometimes raiding songbird nests for eggs and chicks. Crows themselves have neighbors like that, and work hard to drive them away. 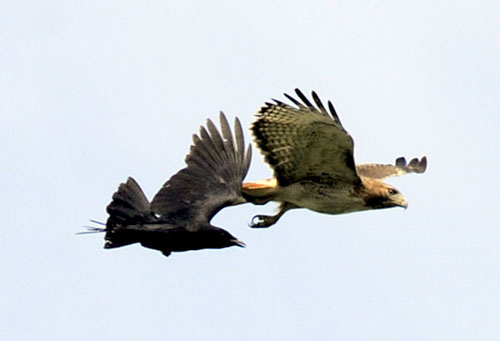 This Red-tailed Hawk drew a crew of four crows as it apparently drifted into the wrong neighborhood. Crows are well-armed for attack, but as in its other forays, this one did no damage. It wouldn’t be a fair fight if the hawk decided to respond.